Are you looking to sell on Facebook using Shopify? If so, you will definitely love this step by step guide. Since Shopify introduced multi-channel ecommerce back in 2016, ecommerce business owners just like you have been turning conversations into sales on Facebook (and other social media sites) and marketplaces such as Amazon among other places..
You, too, can leverage the power of Shopify to sell to your customers on Facebook – the biggest social media platform. You can sell directly on your Facebook page or reach out to customers on Facebook Messenger, which offers you plenty of options. But how do you do all that without going crazy? Do you need technical know-how to integrate Shopify with Facebook? How does it even work; do you sell on Facebook or are customers redirected to your Shopify store? In this post, we answer these questions. On top of that, we show you exactly how to sell on Facebook using Shopify without breaking a sweat. Our aim is to ensure you’re set up and ready to rock the party by the end of this article. We break the post into a few sections making it easy to digest. Please don’t hesitate to share your thoughts in the comment section at the end. That out of the way, let’s get down to business. Selling on Facebook using Shopify is the stuff of fourth graders. You can set up the store point-and-click style and start selling right away. That’s right, you don’t need coding chops to set it all up; just your mouse. Once everything is set, customers can browse your products using the Shop section on your Facebook page. Additionally, you can add unlimited products to your Facebook shop with a single click. Shopify then syncs your inventory automatically. Better still, the Facebook Shop is mobile-friendly to a fault. The developers behind the project understand that over a billion people use Facebook on mobile devices. Your Shopify shop on Facebook will look and perform great across multiple devices. Further, you can provide personalized support via Facebook Messenger offering you the chance to prod customers to make a purchase right inside chat. How suave? And to think all you need to make this happen is the Shopify Lite plan that costs about $9 bucks a month. Remember that you can boost your timeline posts, meaning you can grow your reach easily (and cheaply) since you can target your customers by age, interests and location. On top of that, you can boost engagement by mixing products posts with relevant content that speaks to your audience. Additionally, your customers can share, like, save and comment on your products, which, again, boosts your reach. Also, you can either choose to have the customer checkout on your site or directly on your Facebook page. Choosing Facebook checkout seems like the obvious route to take here because the customer is already logged into their Facebook account, as opposed to checking out on your site, where they might need to create an account. Moreover, all paid Shopify plans come with a Buy Now button that you can add anywhere else you sell, including your blog among other places. This, still, is one more way to increase your sales. It’s like killing two birds with the same stone! If all of this sounds like fun, here are couple of Shopify Facebook stores for your viewing pleasure. With the questions we pitted in the introduction answered in the form of the above benefits, let roll up our sleeves and knuckle down to selling on Facebook using Shopify. Before you start selling on Facebook using Shopify, you must meet some minimum requirements. I list them below. Additionally, read and comply to Facebook Commerce Policy and Community Standards to ensure your shop isn’t banned. You can read more about Facebook product publishing requirements on Shopify. In this section, we shall explore two ways of adding a Facebook shop using Shopify. Firstly, we will look at how to add a shop if you choose to start your Shopify journey with the Lite Plan. Secondly, we will learn how to add a Facebook if you choose to start with any other paid plan. In my opinion, Shopify Lite is the way to go if you only want to sell on Facebook, and don’t require the other advanced features available in the other plans. Go to Shopify pricing page and scroll towards the bottom of the page. Click the View the Shopify Lite Plan link as shown in the image below. On the next screen, hit the Start your free 14-day trial button as we highlight in the image below to start the easy signup process. What I like most about Shopify is how easy it is to use. On top of that, you can create multiple stores using the same email address, but I digress. Let’s get back to business. Enter your email, password and store name and click the Create Your Store button as we detail in the screenshot below. You will see the following screen for a second or two. Worry not, let the process run its course. Next, tell Shopify a little about yourself, or rather your business, and hit the Next button as shown in the image below. After that, enter your default business address and click the Enter My Store button as we highlight below. So far so good, this is great progress. Are you learning something? Clicking the Enter My Store button in the screenshot above redirects you to the admin dashboard with the Facebook sales channel pre-selected as shown in the image below. On the page below, click the Connect Account button as shown. Doing so triggers the Facebook app authorization popup. Click the Continue as [your name] button as shown below. Next, click Ok as shown below. Go back to your Shopify admin dashboard. 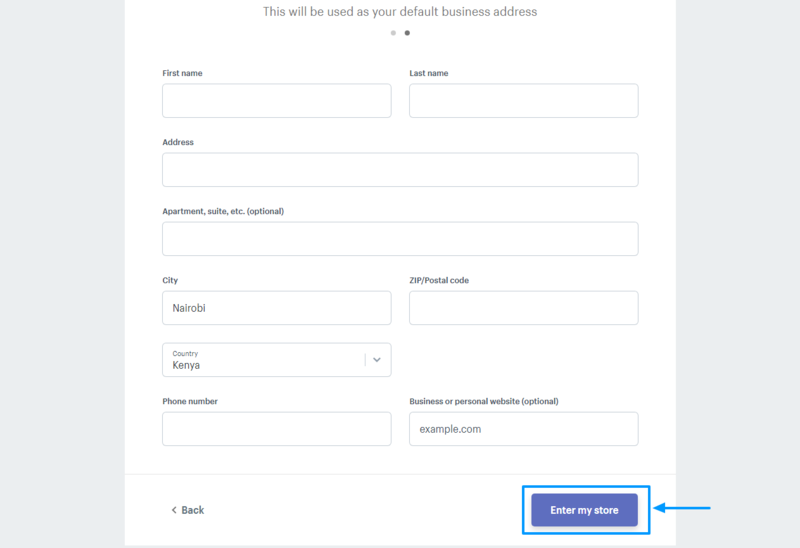 Now, your Facebook account is connected and your business pages appear in a drop-down list. Choose your Facebook business page and click the Connect page button as we illustrate in the following image. After that, carefully read and accept Facebook terms and conditions as shown below. Once you accept the terms, your Facebook shop enters into pending review status. Facebook takes up to 48 hours to review your store. See image below for what to expect. You will receive an email notification informing you whether your store has been approved or rejected. 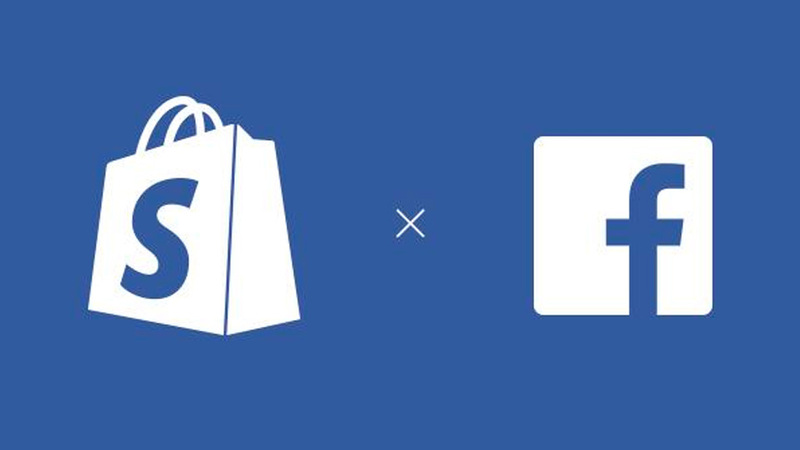 If your store is approved, adding products from Shopify to your Facebook Shop is as easy as A, B, C.
Login to your Shopify store admin dashboard, navigate to Sales Channels and click the plus (+) button next to it. This will launch a Add Sales Channel popup with all available channels including Facebook. Click on the plus (+) button next to the Facebook sales channel to initiate the integration process as shown by the numbered items below. From here, you add a Facebook shop same way we did for the Shopify Lite plan. Once Facebook approves your store, it’s downhill from there. Adding new products and managing your store using the intuitive and easy to use Shopify dashboard is a breeze. Now, you just need to provide awesome products and world-class customer service to keep the business going. Obviously, you don’t want to forget about business promotion. Good thing Facebook makes promoting your business cheap, easy and effective what with laser-sharp targeting. So, use Facebook (as the front-end) to sell your products and Shopify to run the backend e-commerce functions such as inventory management, payment processing and shipping among others. Selling on Facebook using Shopify has many benefits as we saw earlier, but is it the right solution for you? What are your thoughts on selling on Facebook using Shopify? Let us know your thoughts in the comment section below.